Peter Doucet, Morgane Echardour and the rest of 2010 National Roller Cup winners. Coverage of today's New York 100K and Skate Marathon in Prospect Park. Coverage of today's Skate of the Union inline marathon in Chantilly, VA.
Skate of the Union draws skaters with full marathon and NROC points. Coverage of the NorthShore Inline Marathon in Duluth, MN. Photos and videos from Duluth of the NorthShore Inline Marathon expo. Coverage of today's U.S. 10K Classic inline race in Atlanta. Live blog coverage of today's Ottawa Inline Festival in Ontario, Canada. A slew of world class skaters are headed for Monday's U.S. 10K Classic in Atlanta. NROC 2010 rolls into its final month with Sunday's multi-race Ottawa Inline Festival. Live blog coverage of today's Planet Adventure inline marathon in Indiana. Planet Adventure ends its first inline series on smooth pavement and with plans for 2011. Live blog coverage of today's Eastern Seaboard Series, Stage 4 in Trexlertown. A strong field, including members of the U.S. team, will race Saturday in Stage 4 of the Eastern Seaboard Series. Live blog coverage of today's inline marathon in Indianapolis. Live blog coverage of today's Minnesota Half Marathon in St. Paul. Some top NROC skaters will commute to Indianapolis marathon after Minnesota event. Big crowd expected Saturday for second Minnesota Half Marathon. Live blog coverage of today's Chicagoland Inline Marathon in Hoffman Estates, IL. Some of USA's top skaters will compete in this weekend's Chicagoland Inline Marathon. Live coverage of the Class A NROC inline marathon in Indianapolis. This weekend's event in Indianapolis offers NROC points and a world class skate clinic. Live coverage of the Eastern Seaboard Series and the Apostle Islands Inline Marathon. More than 200 skaters are expected for the inaugural Apostle Islands Inline Marathon. World team skaters are among the field for the first East Coast race of the NROC season. Live coverage from the racecourse of the Great Midwest Inline Marathon in Elkhart Lake, WI. Skaters from all over North America head for the Great Midwest Inline Marathon. East Coast Races Sign On! Two stages of the Eastern Seaboard Series join the National Roller Cup. Ty Fidler wins the Eagle Creek Circuit Race in Indianapolis. Olympic gold medalist wins men's race; NROC champ wins women's. Ty Fidler of St. Louis wins the Brookside Circuit marathon in Indianapolis. New inline race series opens with marathon in Indianapolis park. Two gold medalist will contend with a strong field in Sunday's Marathon Roller Montreal. Live coverage of the inaugural May Day 10K in Two Harbors, MN. NROC heads to the Midwest this weekend for the May Day 10K. Live blog coverage of the Texas Road Rash inline marathon in Round Rock, TX. Elite skaters head to Round Rock for this weekend's Texas Road Rash. Building on his success in Chicago, race organizer launches new 3-day event. The Apostle Islands Inline Marathon is the 20th event to join the 2010 race series. Bont's Debbie Rice and Joseph Izquierdo of Colombia win the Squiggy 10K. NROC heads to Florida this weekend for the first marathon of the 2010 season. Thrills, chills and spills at the wet NROC season opener in Los Alamitos. Prestigious race is the 19th event to join the 2010 National Roller Cup. The NROC season opens Saturday with the fast-paced Race on the Base in SoCal. Register Now For NROC 2010! The first 150 skaters who sign up get a set of Bont G4 wheels or Luigino Swiss bearings. Bigger, better with twice the events ... Check out the 2010 National Roller Cup schedule! Stories and news about the 2009 National Roller Cup. Stories and news about the 2008 National Roller Cup. • Send your news to the Planet! 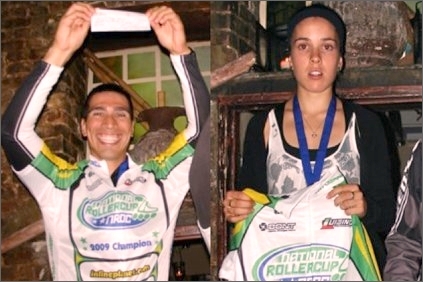 Powerslide's Jorge Botero and Speed Skate World's Morgane Echardour, winners of the 2009 National Roller Cup. Need Some Help to Get You Rolling? Outdoor Racing: The Missing Manual! Everything you need to know about inline racing — a 5-part guide by a2a champ Kim Perkins. Scores of skate tips by top skaters and coaches!